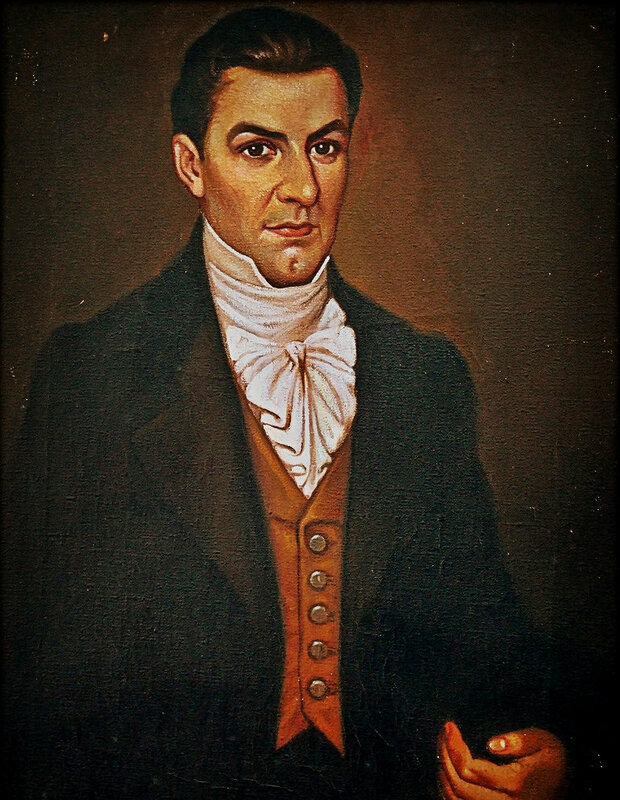 José Matías Delgado y León was among several, including his nephew, Manuel José Arce, who issued the first Cry for Independence in Central America, on this date in 1811 in San Salvador. On this date he is said to have rung the bells of the Church of La Merced, as a public cry for liberty. El grito de libertad, or some variant, is a common phrase in Latin America for the first act in a region calling for independence (see http://www.bookofdaystales.com/grito-de-dolores-mexican-independence/ ). Delgado studied civil law, canon law, and theology in Guatemala at Tridentino Seminary, earning a doctorate from the University of San Carlos de Guatemala. He was ordained a priest, and returned to El Salvador, where from August 12th, 1797 he was provincial vicar of San Salvador, and became intensely involved in pastoral work. In 1808 he began the reconstruction of the old Parochial Church of San Salvador (today El Rosario Church), which was finished a decade later. In San Salvador he became a leader of the movement for independence. On this date he rang out the cry for liberty in 1811 in San Salvador. The rebellion began with the confiscation of 3,000 guns and the funds in the royal treasury. The provincial intendant, Gutiérrez de Ulloa, was removed, as were most governmental employees. The rebels held the government for nearly a month before royal authority was restored from Guatemala. Delgado’s brothers Juan and Miguel were also members of the independence movement. In 1813 Delgado was elected a provincial deputy to the council in Guatemala City. He also became director of the Tridentino Seminary there. He was not in El Salvador at the time of the second insurrection in 1814, and did not take part in it. He was elected provincial deputy again in 1820, and on September 15th, 1821, he was among those who signed the Act of Independence of Central America in Guatemala City. On November 28th, 1821 he became political chief of the province of San Salvador. When the Central American governmental junta voted to join the Mexican Empire (January 5th, 1822), Delgado (and many other Salvadorans) opposed this move. On January 11th 1822 in San Salvador, the city government, presided over by Padre Delgado, and many members of the public protested the decision. Also on January 11th, the government of El Salvador seceded from Guatemala in order to remain outside the Mexican Empire. 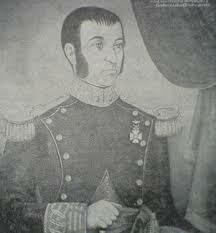 In April 1822 Colonel Manuel Arzú, in command of Guatemalan troops, occupied the Salvadoran cities of Santa Ana and Sonsonate. On June 3rd 1822, Arzú entered San Salvador, reaching the Plaza Major. Nine hours of fighting resulted in many casualties, burned houses and plundering, but the Guatemalans then withdrew. Delgado’s nephew, Colonel Manuel José Arce, was one of the commanders of the Salvadoran defenders. On June 6th 1822, Salvadoran troops reoccupied Santa Ana, and later also Ahuachapán and Sonsonate. On December 2, 1822, fearing further encroachment from Guatemala, El Salvador officially asked for annexation to the United States. A delegation was sent to the United States to negotiate. That same month, Brigadier Vicente Filisola, Captain-General of Guatemala (within the Mexican Empire), marched toward San Salvador. He entered the city on February 9th 1823, declaring respect for people and goods, but also the annexation of the province to Mexico. This was the end of the government of José Matías Delgado. On the fall of Mexican Emperor Agustín de Iturbide in 1823, Central America declared its independence. Delgado was elected one of the representatives to the constituent congress of the Federal Republic of Central America. 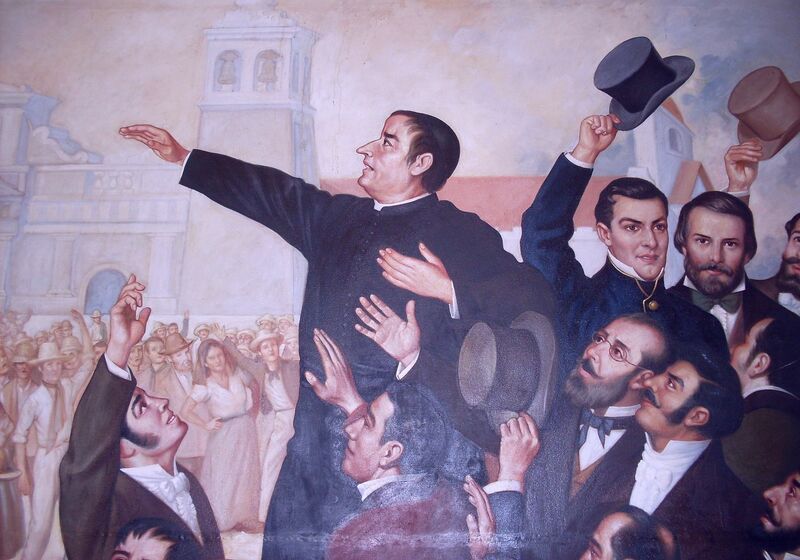 This Congress met in Guatemala beginning on June 24th 1823, and Delgado was chosen to preside. On May 5th 1824 he was named the first bishop of San Salvador by the local civil authorities and not by the Catholic Church. This entangled him in a serious and long-lasting controversy with the Archbishop of Guatemala and the Vatican authorities that lasted until his death. In 1824 he bought in Guatemala, with public money, the first official printing press in El Salvador. It was used to publish the first Salvadoran newspaper, El Semanario Político Mercantil. The first issue appeared on July 31st 1824. 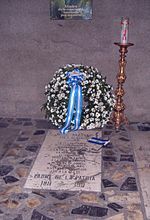 Delgado died on November 12th 1832 in San Salvador. As his funeral procession passed the Plaza Mayor, mourners showered his coffin with white rose petals. His remains are interred at El Rosario Church. On January 22nd 1833 the National Assembly declared him Benemérito de la Patria (National Hero). 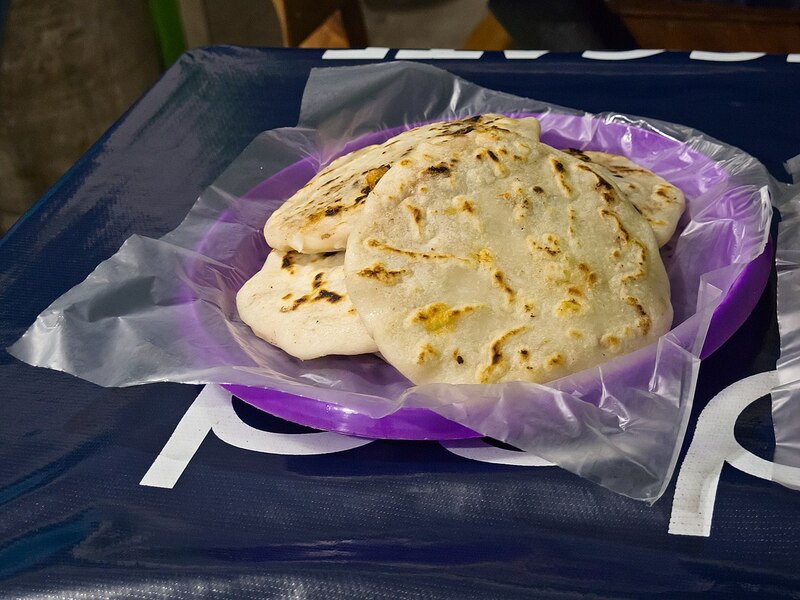 El Salvador’s most notable dish is the pupusa, a thick handmade corn flour tortilla stuffed with cheese, chicharrón (cooked pork ground to a paste consistency), refried beans, or loroco (a vine flower bud native to Central America). There are also vegetarian options, often with ayote (a type of squash) or garlic. Pupusas are served with salsa roja, a flavorful Salvadoran cooked tomato sauce, and with curtido, a pickled cabbage dish. Quesillo is a Salvadoran cheese curd that is perhaps the most popular filling for pupusas. This video will give you the basic idea, although you need to brush up your Spanish. It is good on how to shape the pupusas and cook them, but assumes you know how to make the dough, so a recipe follows. In a large bowl, mix the masa harina with the water and salt, stirring well. Add more water if necessary to obtain a soft dough that does not crack around the edges when flattened. Let the dough rest, covered with plastic wrap, for about 15 minutes. [see the video for this part] Divide the dough into about 6 pieces. Lightly oil your hands to keep the dough from sticking to them. Form each piece of dough into a ball, then make an indentation in the ball. Place your filling of choice in the indentation, and carefully wrap the dough around the filling to seal. Flatten the ball into a disk, about ¼ inch thick, being careful to keep the filling from leaking out of the edges. This will take practice. Wipe a very small amount of oil on to the surface of a heavy skillet. Heat the skillet over medium heat, and place the pupusas in the skillet. Once the bottom of the pupusa is browned, flip it over and cook the other side, about 2 to 3 minutes per side. Remove from the heat and serve warm with a side of curtido and salsa roja.